What and When Are Hawaii’s Seasons? If you live anywhere besides the tropics (and most of you probably do), identifying the four seasons is pretty easy. Not so if you live in Hawaii. In fact, we don’t really have four “seasons” at all. Instead, we have two different weather patterns: summer and winter. Although each season varies a bit in precipitation, the temperature variance is small. This is because there is only a slight variation in length of night and day from one part of Hawaii to another and because all its islands lie within a narrow latitude band. Also, we have a nearly constant flow of fresh ocean air across the islands, which regulates the temperature. Summer:: Summer (called Kau in Hawaiian) runs from from May to October, with an average daytime summer temperature at sea level of 85 degrees Fahrenheit. (29.4 C). At the beginning of the “dry” season (April or May), less rain starts to fall on the islands as the trades die down to their summer levels. The weather is almost always perfect (although the windward sides of all the islands can still get quite a bit of rain). Water temperatures measure near the high 70-degree mark this time of year, and the surf begins to die down as the trade winds let up. Toward August and September (the warmest months of the year), the islands really warm up, and temperatures can reach as high as the 90’s under the right conditions. Combined with the high humidity, the heat can occasionally be overwhelming if the tradewinds aren’t blowing. Surf is at its lowest during the summer, and the rain clouds are few and far between except on the windward coast, which has cloudy/rainy weather occasionally all-year long. Water temperatures usually rise above the 80-degree mark. Although summer is considered the “dry” season in Hawaii, this period also coincides with hurricane season, which could bring storms to or near Hawaii. During summer, a scene like this near Kailua-Kona is the norm, with sunny skies and whispy clouds. Winter: Winter (called Hooilo in Hawaiian) runs from November to April, with an average daily temperature of 78 degrees Fahrenheit (25.6 C). At the beginning of winter (around November and December), more rain begins to fall as the trades increase to their winter levels, and there are days where rain showers will dominate on the windward coast and mauka areas. This is also when Kona storms may hit the islands. When a Kona storm develops or moves into the area, the prevailing wind pattern changes. South and southwesterly winds replace the trades. Since the winds typically affect the Kona coast of the Big Island, the storms have thus taken on that name. In winter, the high temperature remains a comfortable average of near 78 degrees. Water temperatures are often around 74 degrees during this period, and swimming can be rough as a result of the higher surf. If you’ve always wanted to see the high surf of Hawaii, now is the time to come, as these are the months during which the big surfing competitions take place. Because the jet stream drops a bit lower in winter, storms that bring heavy rain can hit the islands, but typically, only the windward sides of each island will see significant, persistent rainfall. 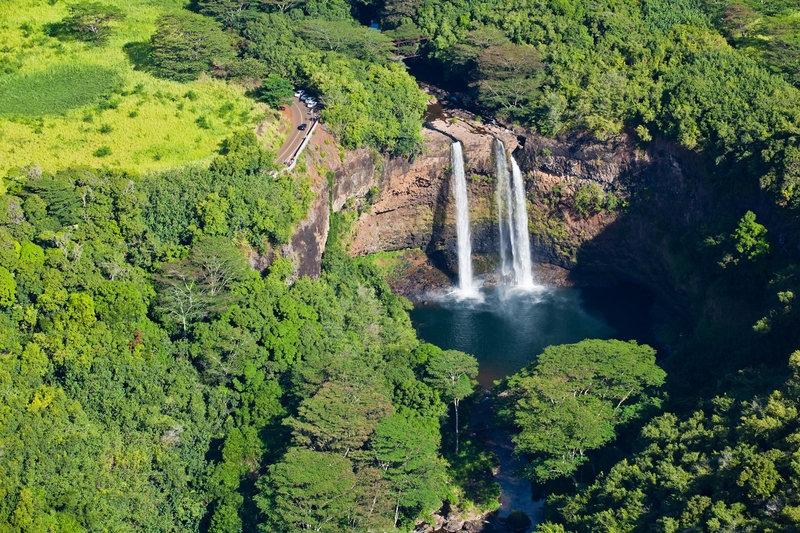 Wailua Falls in Lihue is one of the easiest to access, and it's a great hike for beginners. 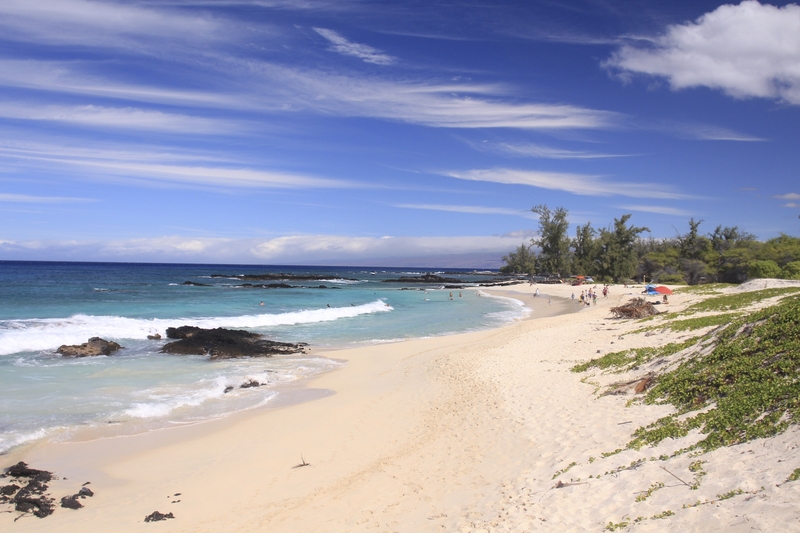 Knowledge of the seasons is especially important when you’re booking Hawaii activities. At Hawaii Aloha Travel, our travel specialists can let you know which activities are best for which time of year. For example, if you’re thinking of scuba diving, you’ll want to be sure to choose a protected area if you’re visiting Hawaii during winter. Anytime of year is a great time of year in Hawaii, but there are small variations in temperature and precipitation that may affect your travel plans. So, keep these tidbits in mind when you book your next Hawaii vacation through Hawaii Aloha Travel.